Where do I begin with this set. 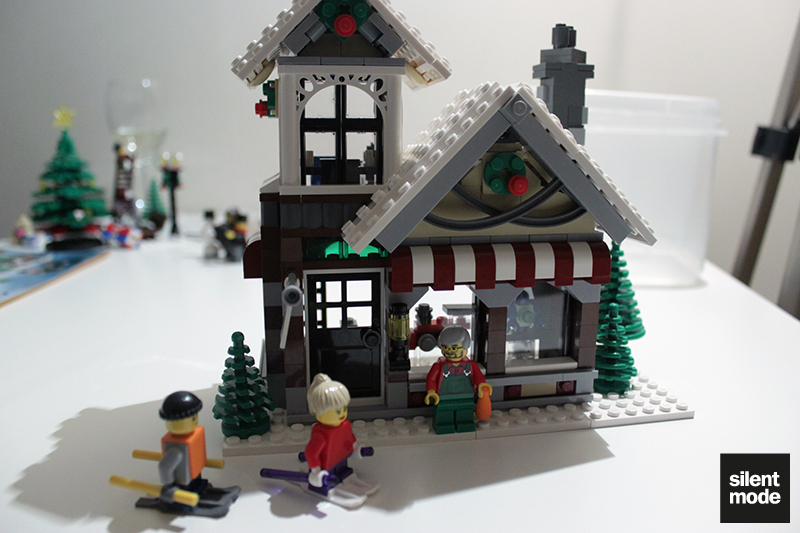 Well, just under a year ago I’d wanted to get the Winter Toy Shop (over the Bakery) for myself, but the price was well out of my range. 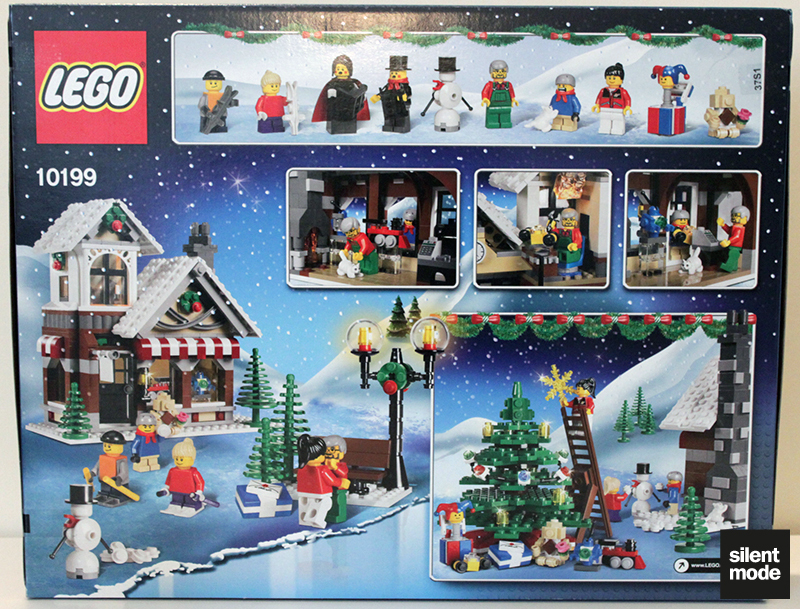 Having missed a golden opportunity to get it at half price at John Lewis, I was fortunate enough to see this set (along with the Bakery) in Lego stores a few months later, but at regular prices. 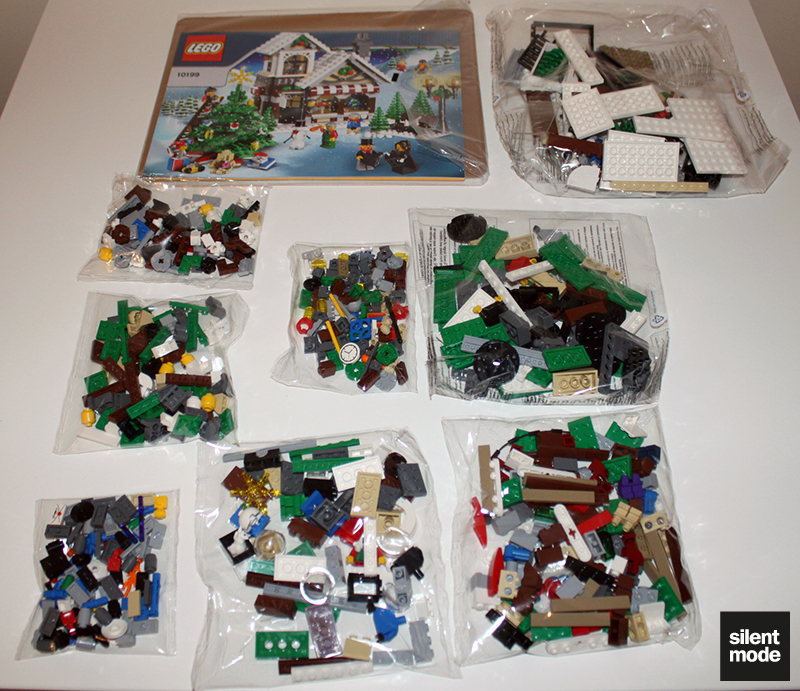 Adding to the difficulty of buying the sets were the fluctuation of prices as time went on. If I recall correctly, the Toy Shop was GBP 39.99 around this time last year, rose to 40.99 after Christmas, and has recently increased to the current price of 44.99. 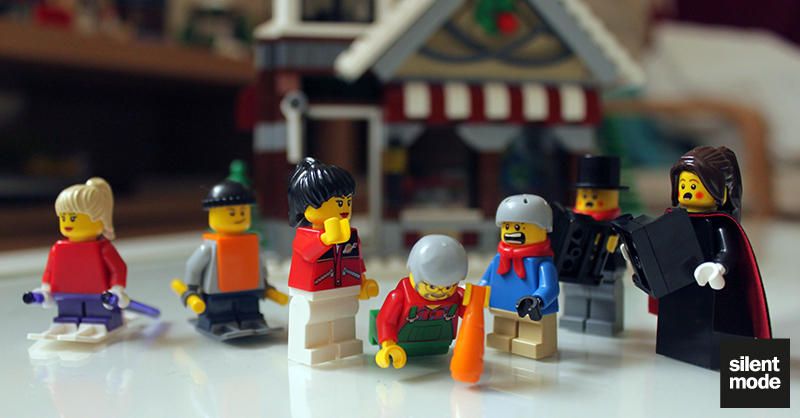 (Sometimes I get prices for the Toy Shop and the Bakery mixed up.) But in the end, having taken the plunge with the more expensive Winter Post Office, I decided to buy the Toy Shop first. After all, October is double VIP points month. 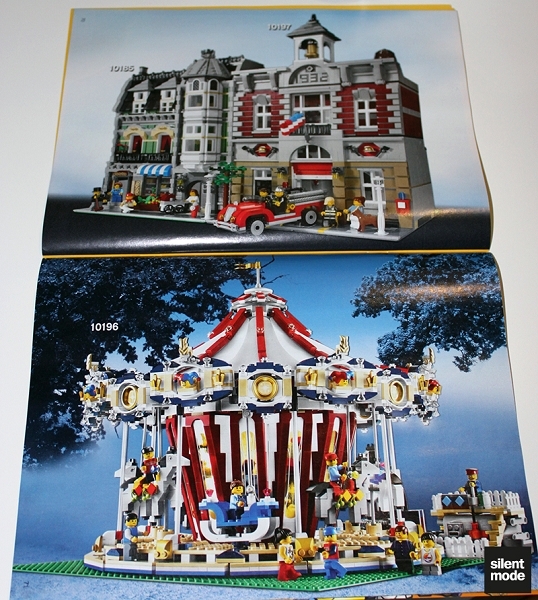 The main difference is that the name of the set is displayed on the front of the original box, just like the box art for the Grand Emporium. I was initially under the impression that the set I’d bought was a re-release, perhaps with a different assortment of parts. We’ll eventually see. 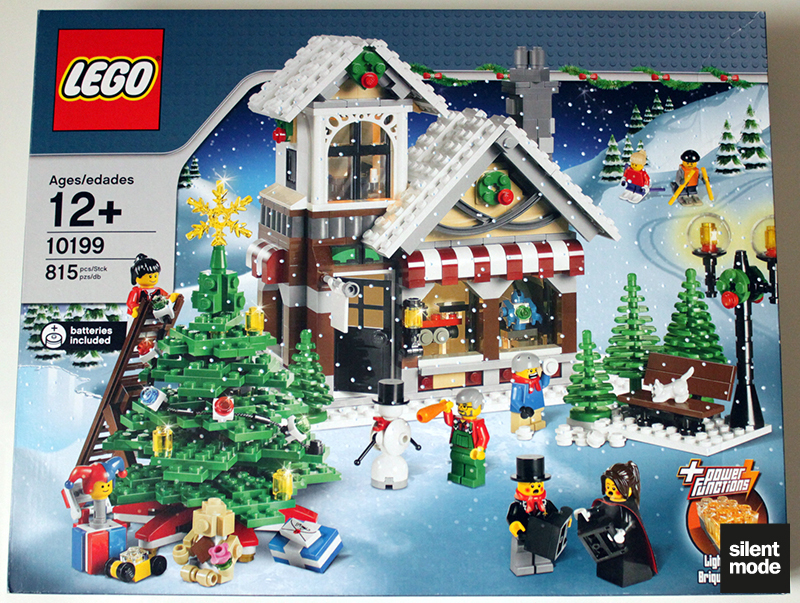 Also, the official name is the Winter Toy Shop; for some reason I’ve been calling it the Winter Toy Workshop, or even the Winter Village Toy Workshop. Doesn’t matter much. 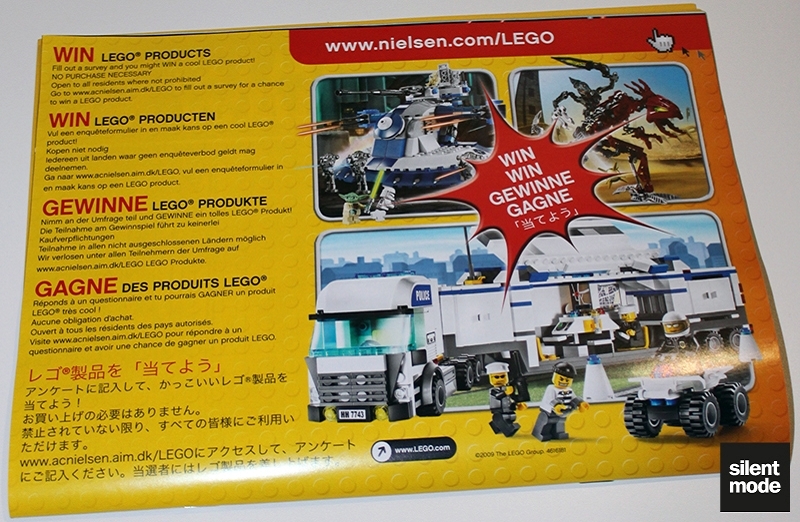 The back of the box shows the cast of the set at the top, as well as different scenarios with the models. 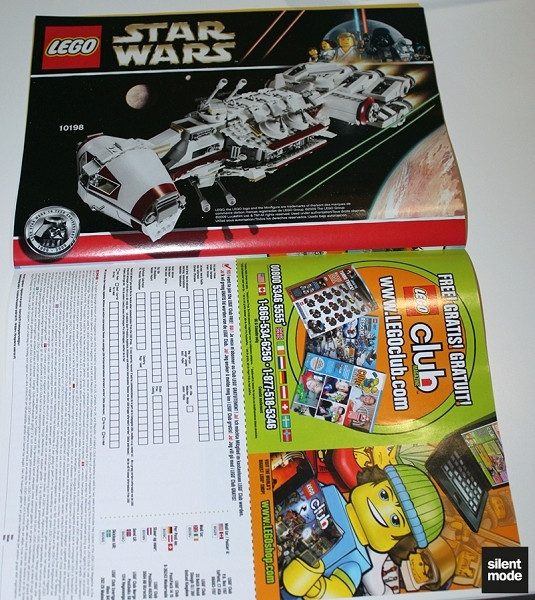 One of the long sides of the box confirms the set’s official name. The price sticker confirms the current price for this set, as well as the year(s) of release. The multicultural roots of the set; China once again is involved, although I have no idea how or where. 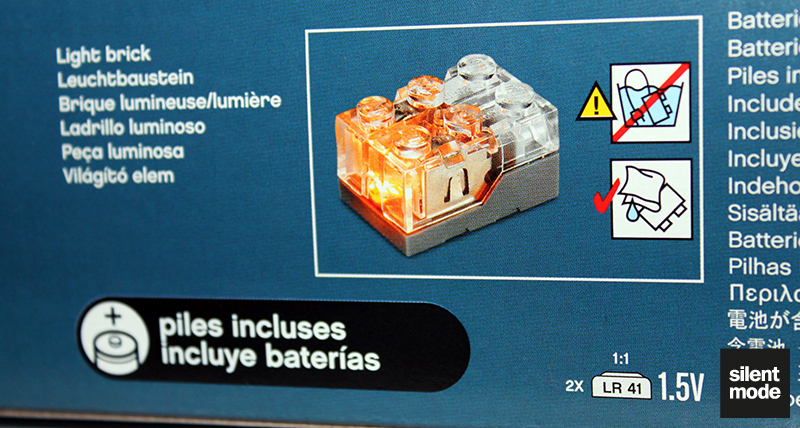 Again, French light bricks come packaged with “piles”. Do not douse them in water; wipe them gently with cream (sold separately). 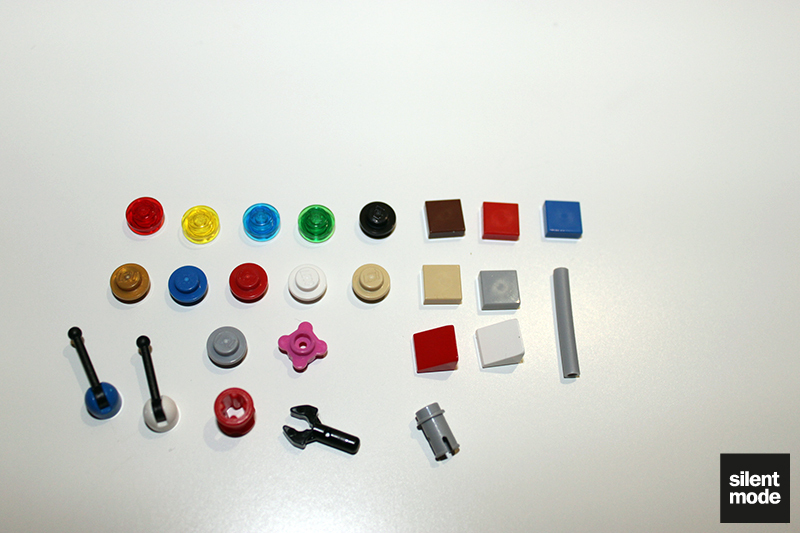 Not one but two minifigures displayed next to the parts list, to demonstrate the scale we’re working with. And what a parts list it is. Just from this segment you can see there are quite a few pieces – almost as many as the Winter Post Office. Open the box, tip the contents out, and feast your eyes on the nine bags of random bits and pieces. As with the Post Office, the bags are unnumbered and contain an assortment of similarly-sized parts. 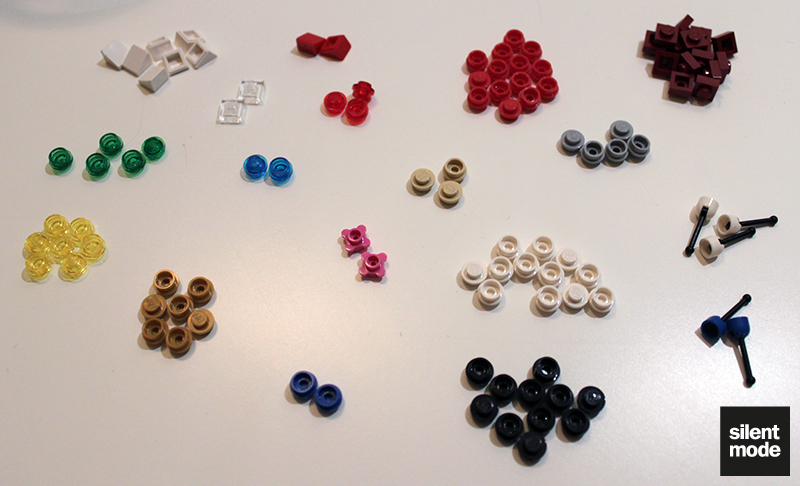 Just one look at one of the bags, containing small pieces, indicates we might have a problem building this thing… Many of the pieces in this set are small. 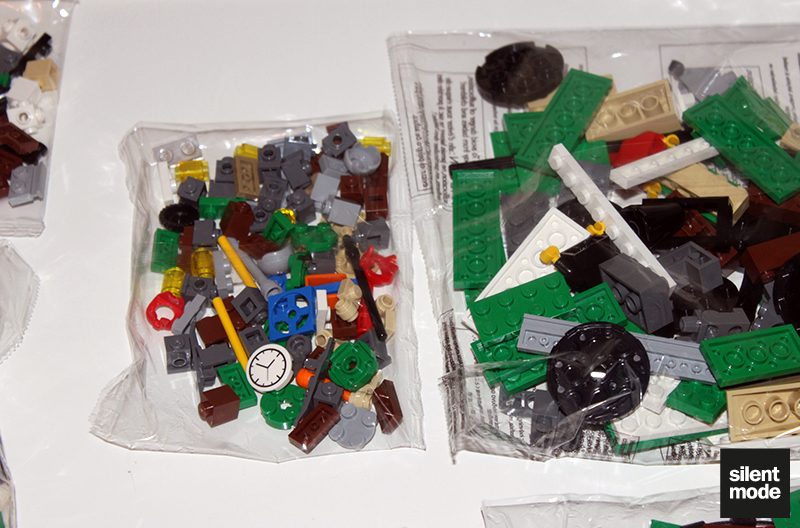 And if that wasn’t enough: one of the large bags gives birth to two more bags, full of more small parts! 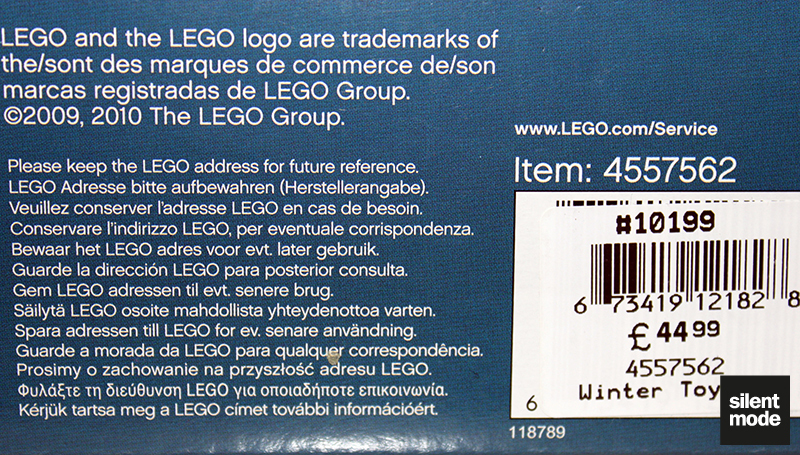 Here’s the light brick included in this set, still in the containing bag. The protective tab prevents it from lighting up until we’re ready. 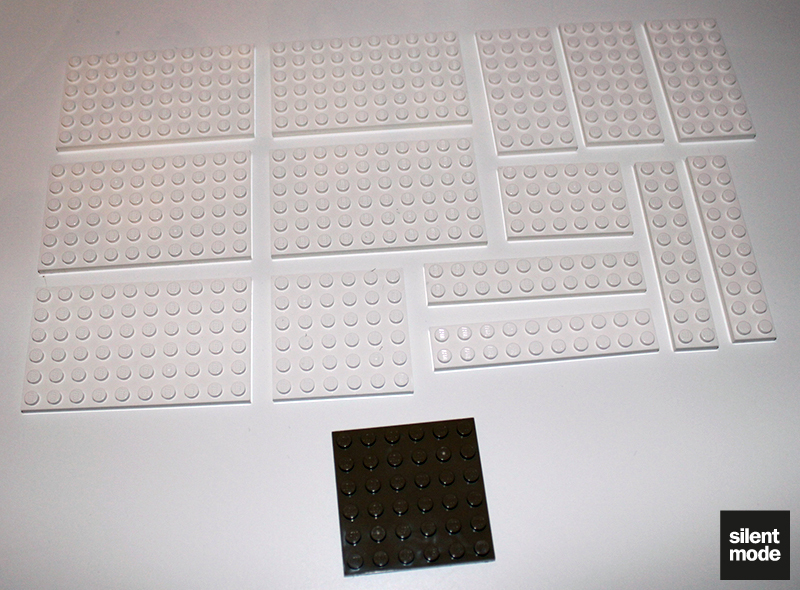 The largest plates we’re going to be working with in this set are 6×10 white plates, and there’s five of them. There’s also a 6×6 dark tan plate. Here we have most if not all of the green plates offered in the set, ranging from 2x6s to 1x1s and a couple of round 2x2s. Green is in this set what dark green was in the Post Office set. Some of you might be wondering why I make a fuss about green elements. 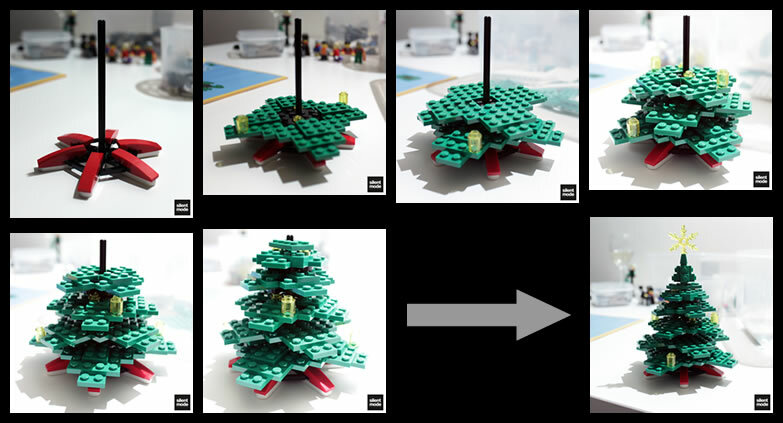 Well, around this time last year when I was building an MOC, I found it surprisingly difficult to get hold of certain Green elements (particularly 1×1 round plates), as well as having very few Green parts in my collection. It also appeared that Lime – an okay colour in itself – was replacing Green as the new standard green. So, whenever I see this much green in a set, it’s good news. 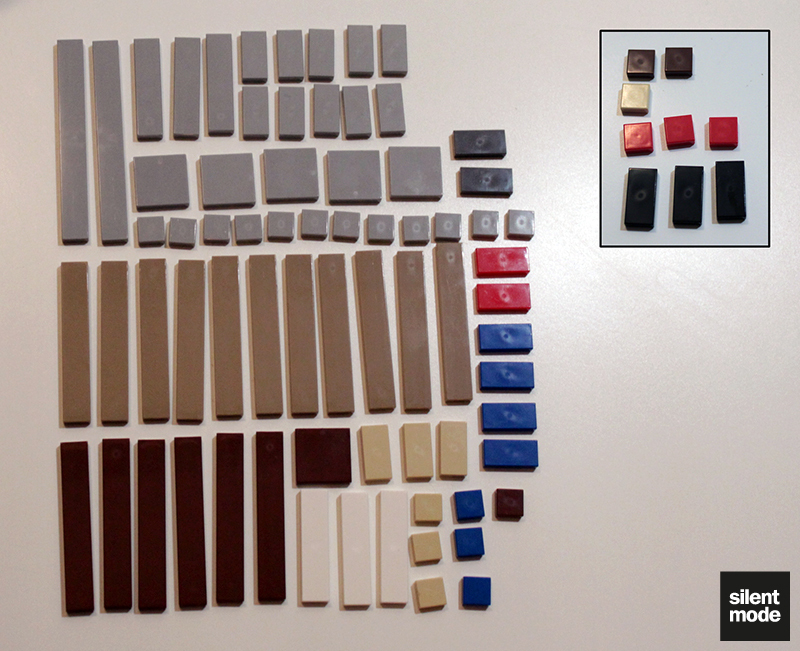 Here we’ve got quite a selection of tiles in many different colours, but nothing out of the ordinary. Many different coloured 1×1 round plates, as well as some “cheese” slopes and joysticks (levers), which I haven’t seen in a long time. 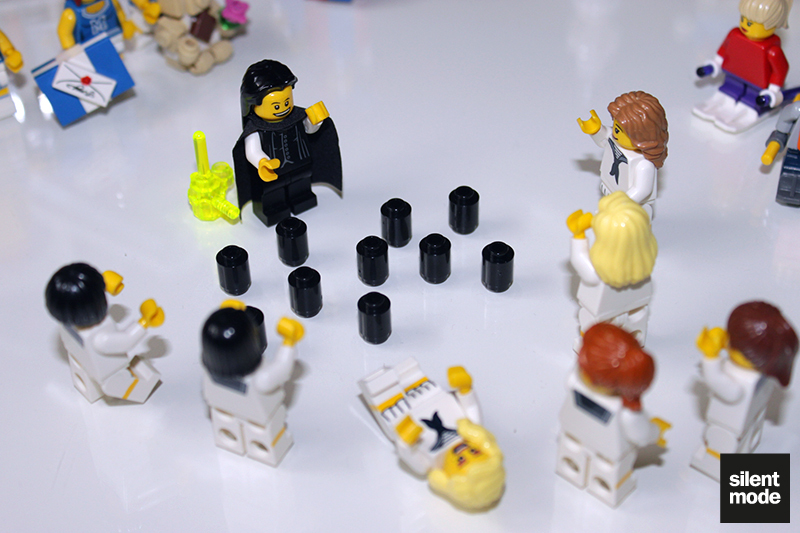 I’ve also included in this picture a couple of transparent and some dark red 1×1 plates. 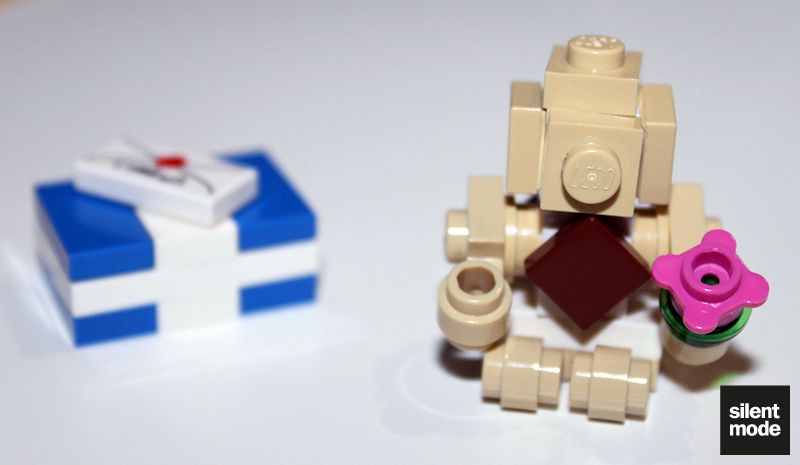 Quite a few interesting pieces can be found in this set, and here are some of my favourites. First we have not one, not two but four trees in two different sizes, and all brand new. We also have an intriguing arch piece in white, obviously used for decorative purposes, and a brown ladder. 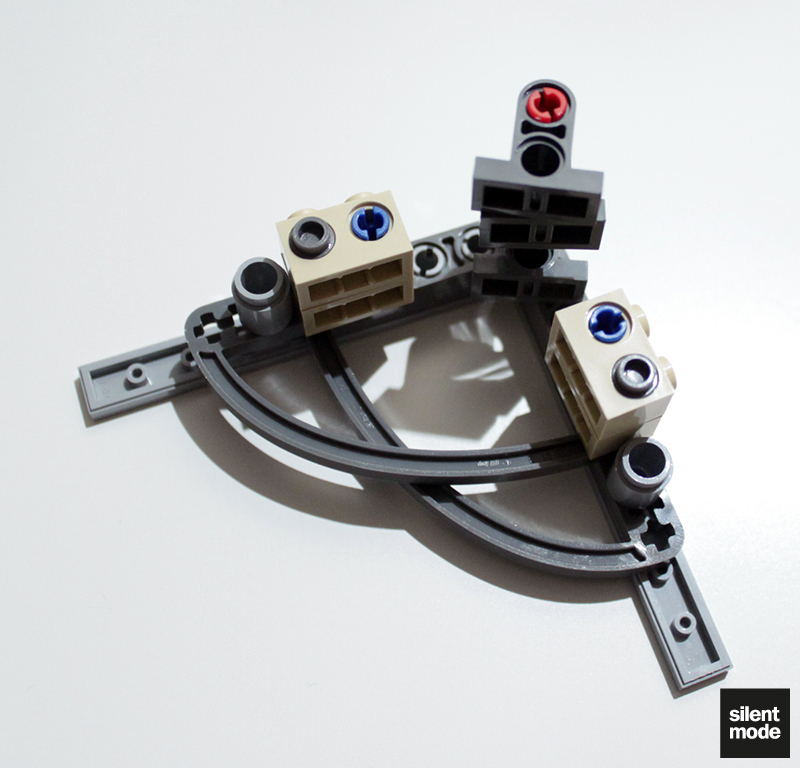 In terms of bricks: we have six transparent 1x2s (four in Trans Clear, two in Trans Green), which you’d be lucky to find in a PAB wall but would cost you quite a bit bought online. (GBP 0.22 a piece for Trans Clear 1×2 bricks on the online PAB.) The numerous and useful SNOT bricks (on the left) suggest there’s quite a bit of SNOT work involved. As for slopes: we have this odd 1×3 double-sided slope in Light Bluish Grey, and two 2×4 slopes in Tan. 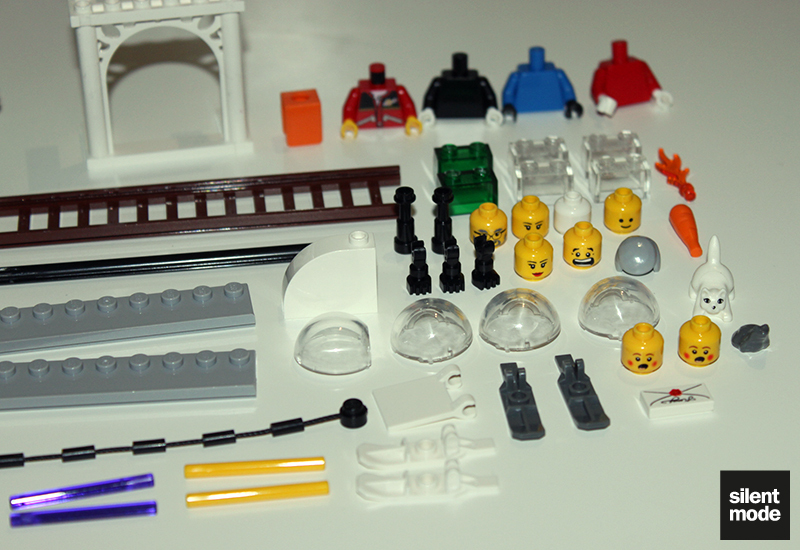 A quick look at some of the minifigure parts reveals the two exclusive heads (with rosy cheeks), as well as some other interesting choices for minifigure heads – including a blank white one and the classic smiley! Perhaps not such an impressive selection of torsos, but at least three of them are plain. We also have four transparent hemispheres, which are used to build this set’s lamppost. 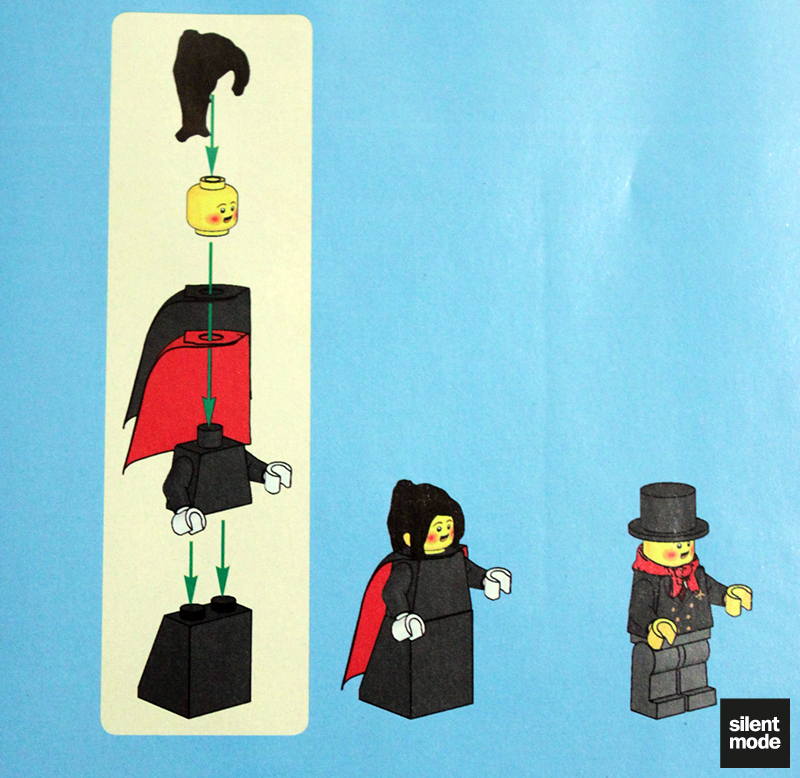 I can see these parts being really useful for future MOCs, but bear in mind that the only other set with these pieces is the Spongebob Squarepants Rocket Ride set. Also note the presence of a Dark Bluish Grey frog (purely for decorative purposes) and a white cat with a face print. Last but not least, the manual is safely packaged in its own bag with a cardboard backing. 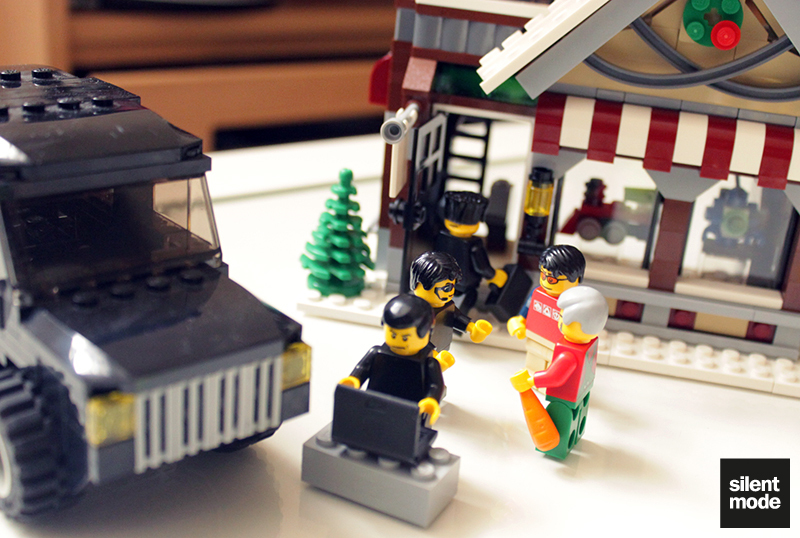 Unlike the Post Office, this set does not come with a DSS (dreaded sticker sheet). 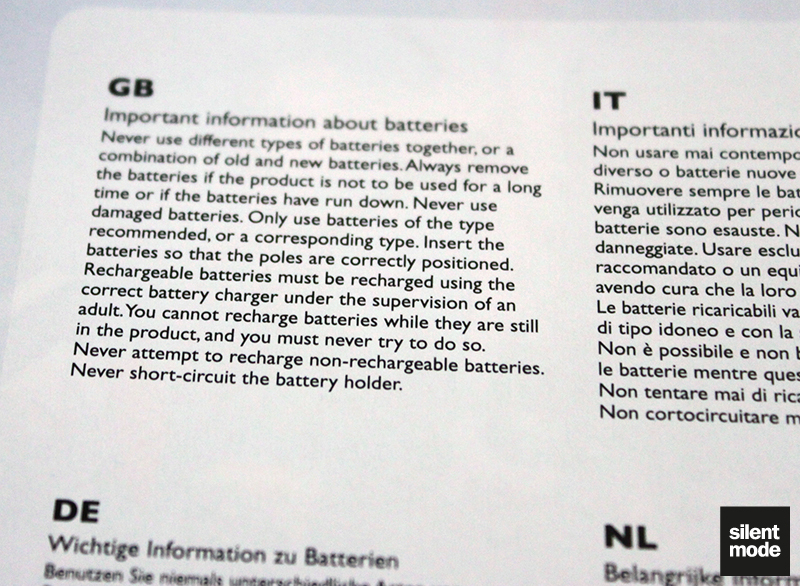 …before giving us a premature reprimand about battery replacement, in several different languages. The magic seven, which includes two adult carollers, three kids and an old man. One of the kids has that scared face that many an MOCer just loves to insert into their creations. While the recently remarried Mrs. “Two Cloaks” Prescott gets two layers of cloakage, her divorcee husband Mr. Cholmondley-Warner gets a measly little scarf. I guess the pilot’s jacket and top hat make up for it, however. 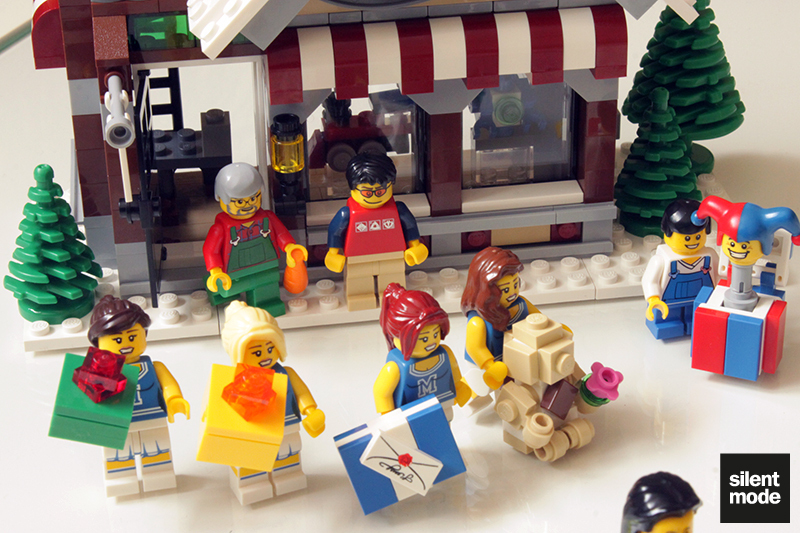 Like the Post Office, The Winter Toy Workshop has four models to build, and here they are in the instruction manual order. The smallest and by far the easiest model to build, although something like this would be more suited for an advent calendar. 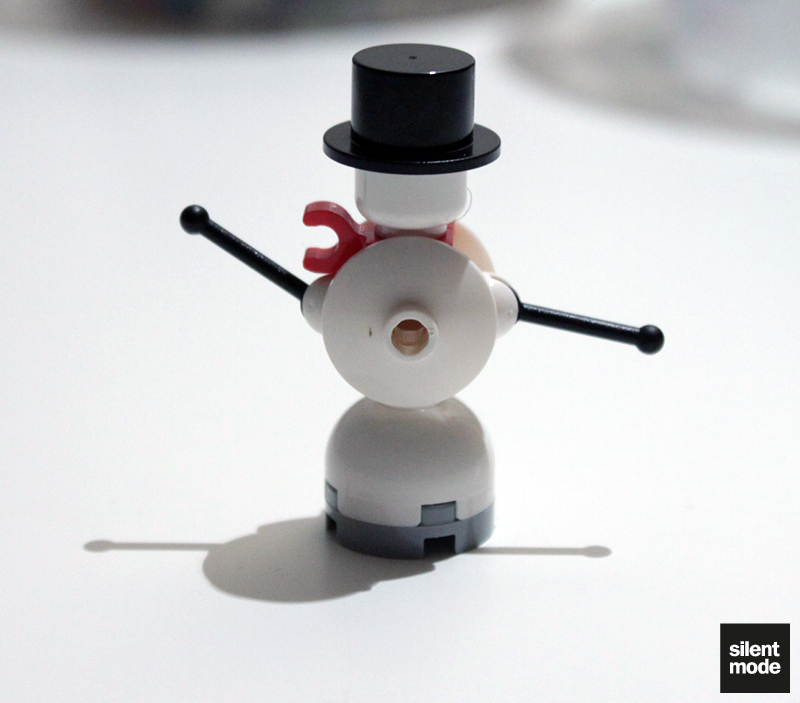 Still, it’s a good impression of an organically-built snowman – the dishes give the impression of a round body, while the red clip piece represents a scarf blowing in the breeze. 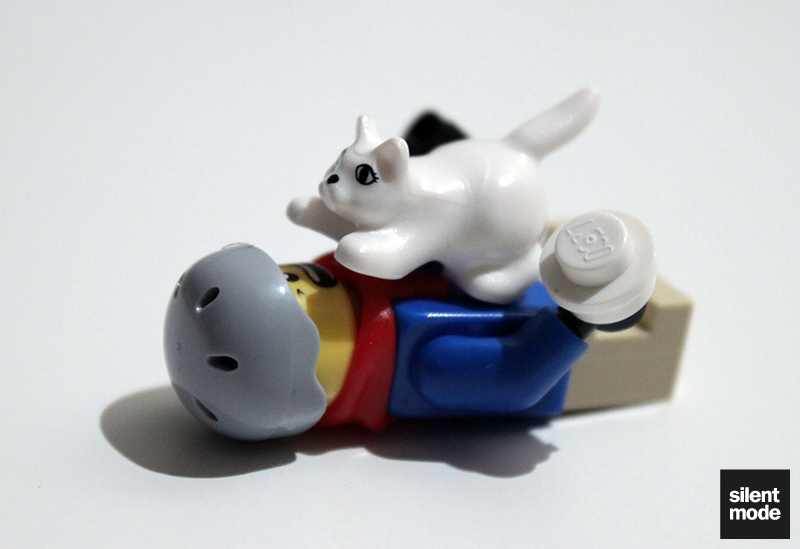 This is also where the plain white minifigure head goes. 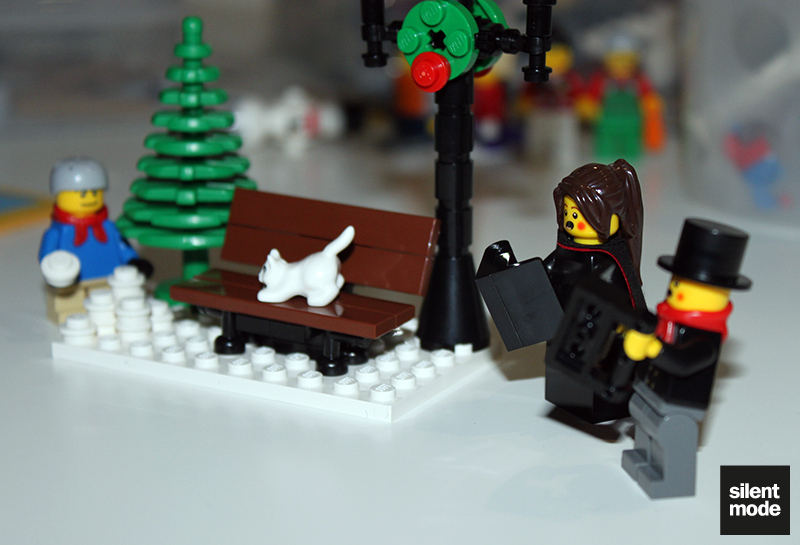 This display is occupied by the two carollers, the cheeky kid with a snowball, and the little white cat that sits on the bench. 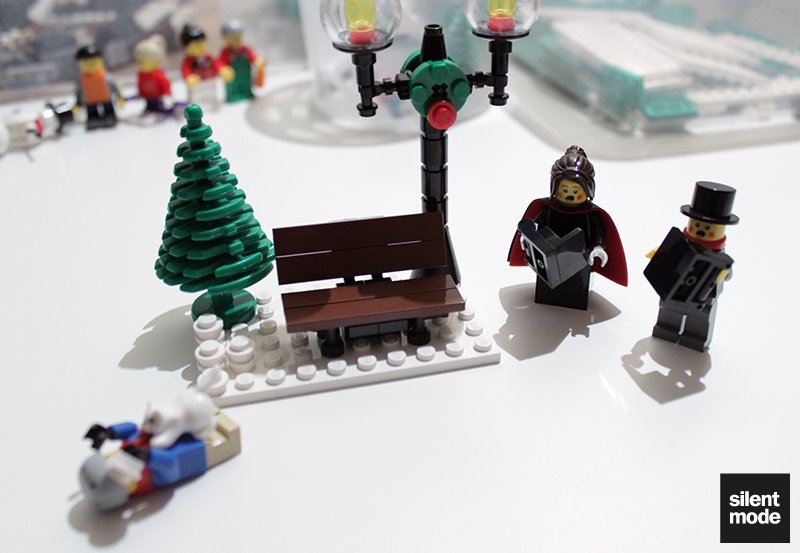 The bench is built pretty much in the same way as the one in the Post Office set, except four tap pieces are used for the legs instead of “log” bricks. Be sure to tell your kids this Christmas: if they plan on attacking carollers with snowballs, or anything else for that matter, the ninja cat is going to come and get them. Not a festivity tree, not a pine tree and not even a green tree. This is a Christmas tree, because Snowdonia hasn’t succumbed to political correctness. I was concerned about the choice of colours for the base of the tree: the combination of red and white gave the impression that it was going to do a Spin Dash. Also, and rather strangely, the base is wobbly on its own. Much later in the tree-building stage some gold 1×1 round plates are added to the base to make it stand – but why they weren’t added in the beginning is a mystery. 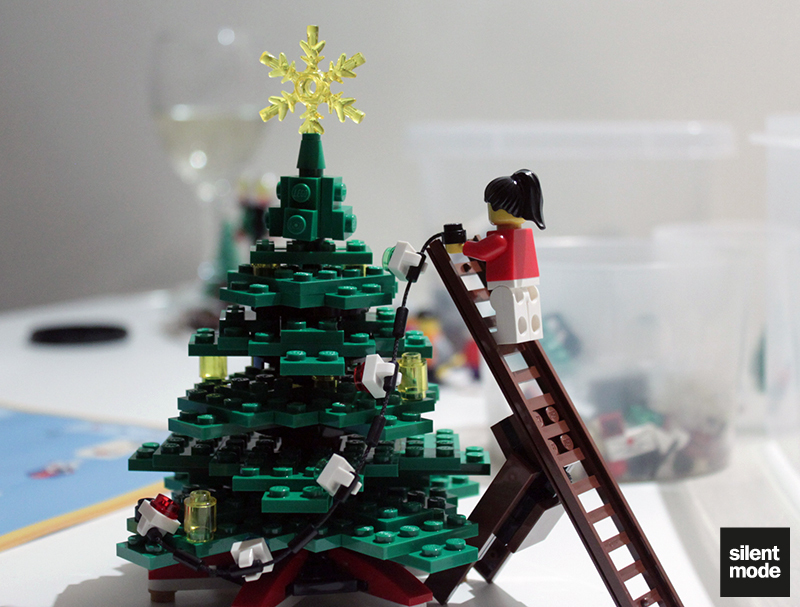 … as well as some gifts to go under the tree. 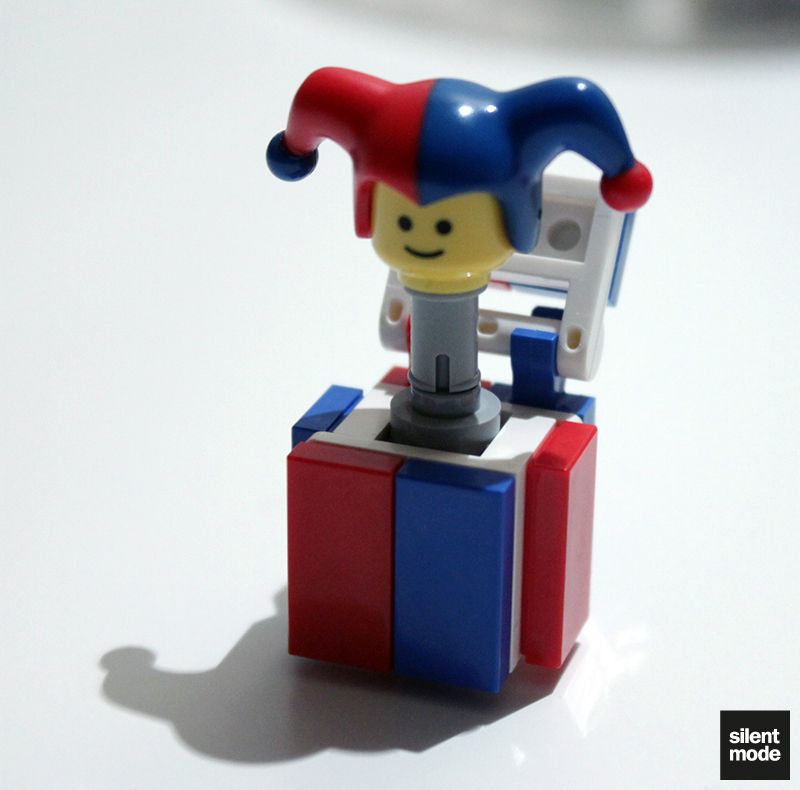 The construction of the jack-in-the-box is quite clever: using one of the four-way SNOT bricks with two bracket pieces creates a neat but somewhat brittle box. Also, the lid is purely for decoration; it doesn’t close over the hole properly. Ten steps deep and we’ve got the base of the Toy Shop. 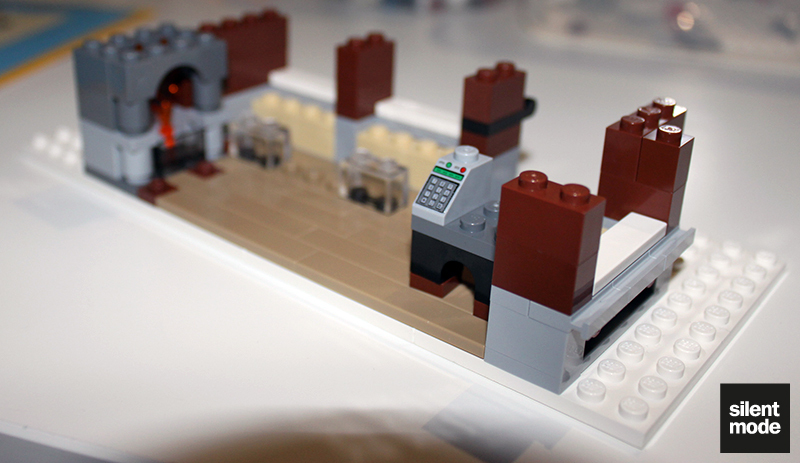 We’ve added a small cash register at the back and the beginnings of a fireplace on the right, as well as Dark Tan floor panels. At this point I’m curious as to what purpose the black clipping piece at the front serves. Of note: the flames are actually Trans Orange, as opposed to the Trans Neon Orange ones we’re used to seeing. 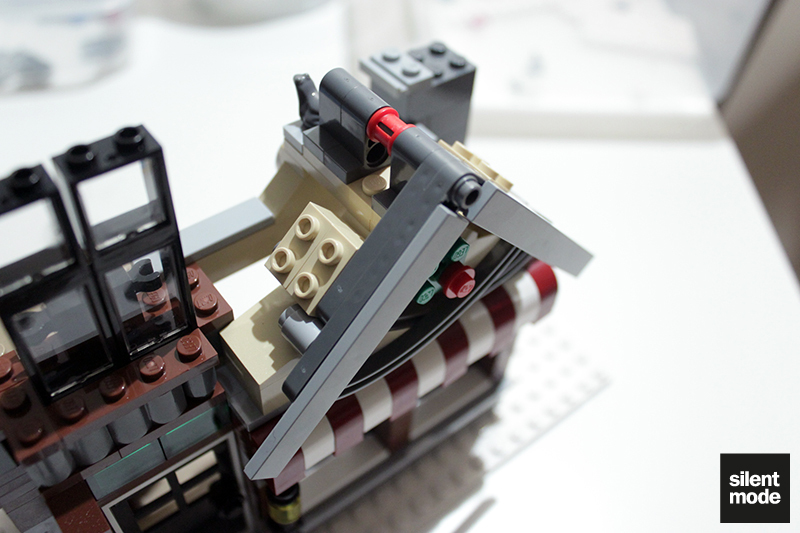 Even at step 20 of this model, we haven’t even gotten halfway through the instruction manual – but we’re beginning to see the shop take shape, and right now it looks more like a candy shop with the awning. 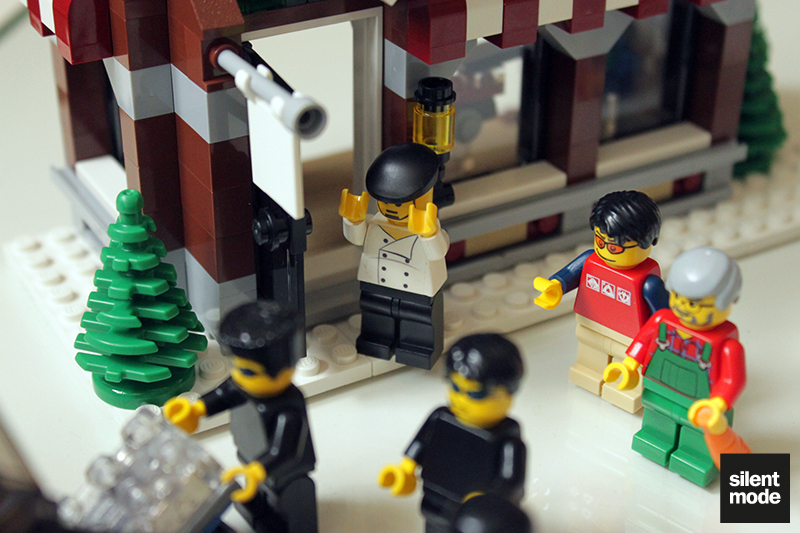 We can see some neat little toys displayed in the shop windows, as well as a black front door and a white flag (representing a sign) dangling in the breeze. 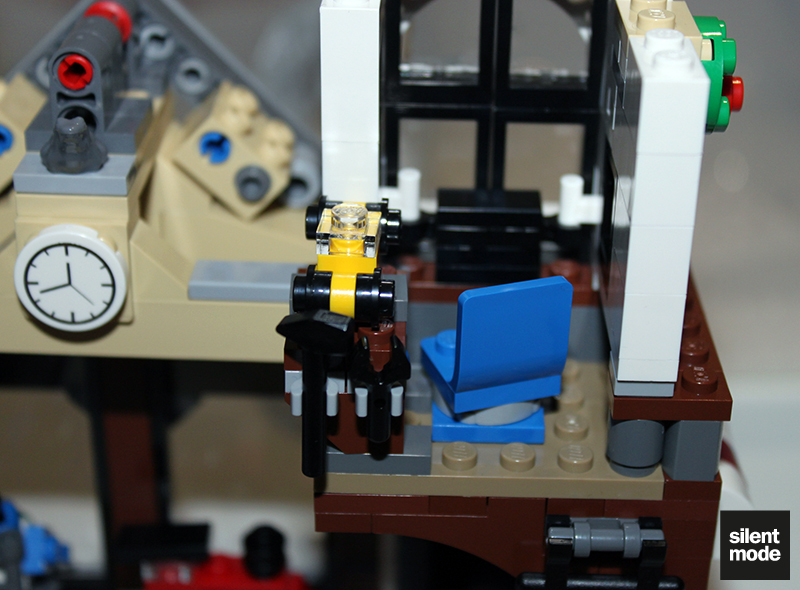 The clip is now revealed to hold a little lamp, cleverly constructed using a black skeleton leg, a Trans Yellow round brick and a black 1×1 round plate. A ladder hung precariously at the back of the model leads to the top floor. And here we can see the beginnings of the side chimney. The use of many Dark Bluish Grey headlight pieces indicates a common SNOT technique used for creating brick textures. Some of the 1×2 jumper plates had grooves at the bottom (like tiles), and some of them didn’t. 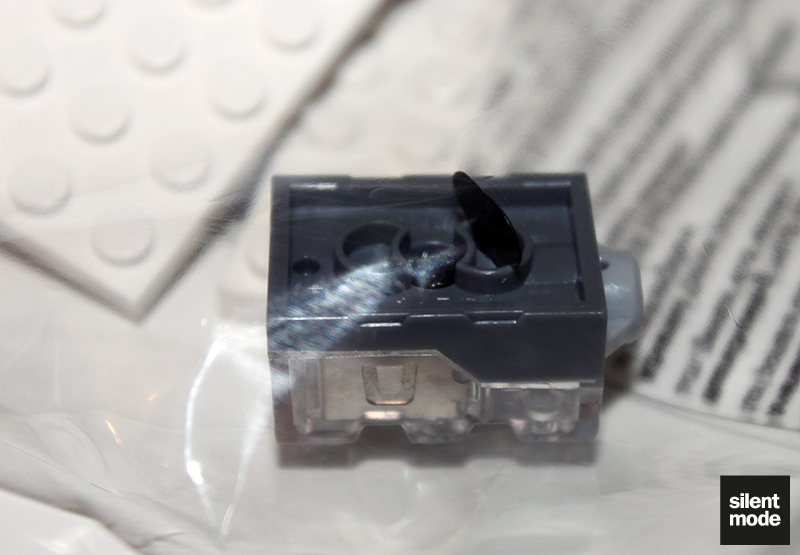 There currently isn’t a listing on Bricklink for the grooved variation, which suggests this is a new part. Perhaps someone could confirm? Now we’re getting to work on the top floor, and here we have the beginnings of a very tiny workshop, as well as the front part of the roof. From here on in most of our efforts are going to be focused on the roof itself. Believe it or not, this construction is going to give the snow-covered roof its shape. 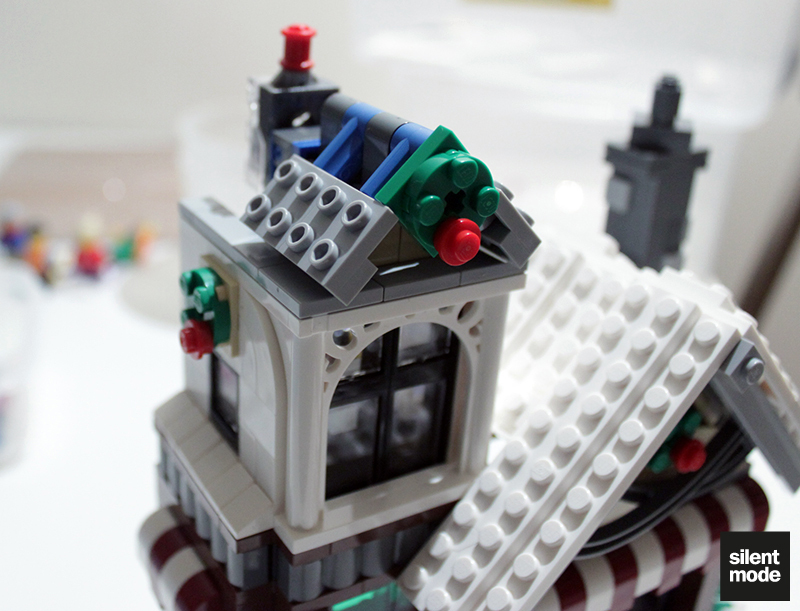 I’ve gotta say, the Technic parts detract from the Christmassy feeling of this set – but that’s how the designer chose to construct the roof. …and from the back. You’ll also see the decorative frog (which will unfortunately be concealed later on) and our famous analogue clock. 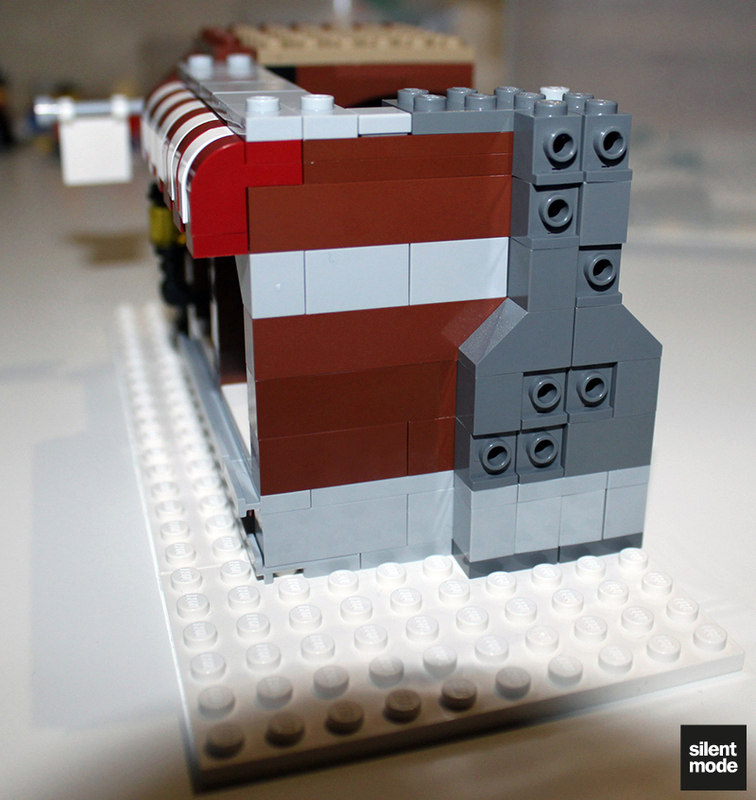 A rather cool feature on the right: the walls of the workshop are attached using clips and 1×1 bricks with handles. 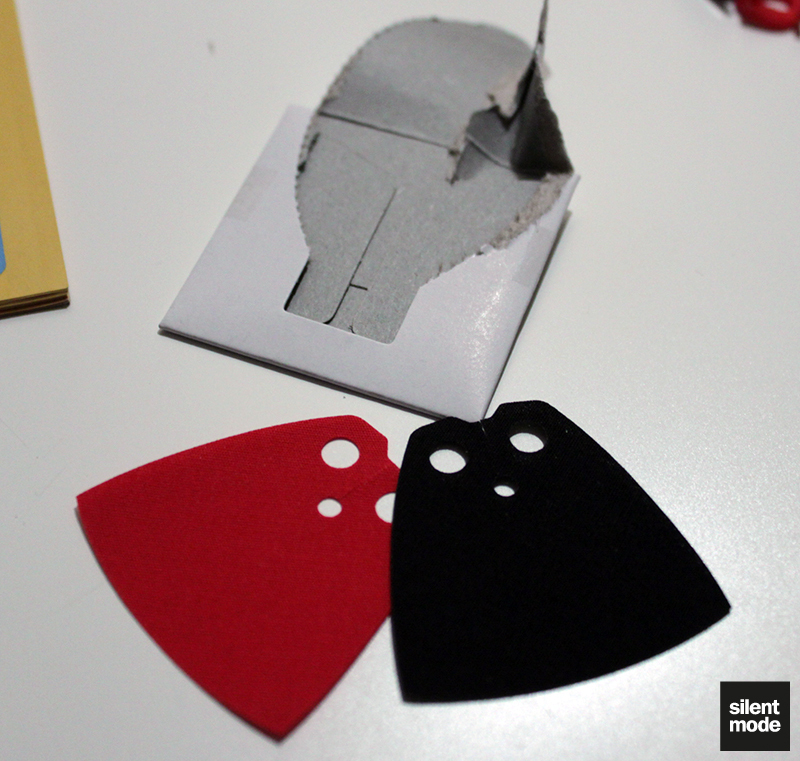 This is purely for aesthetic purposes, because you won’t be able to open them up (as you’d expect) once the model is completed. Before we add the roof parts, the workshop is kitted out with a workbench complete with model car. We can now see just how small this workshop is, but size isn’t everything I guess. 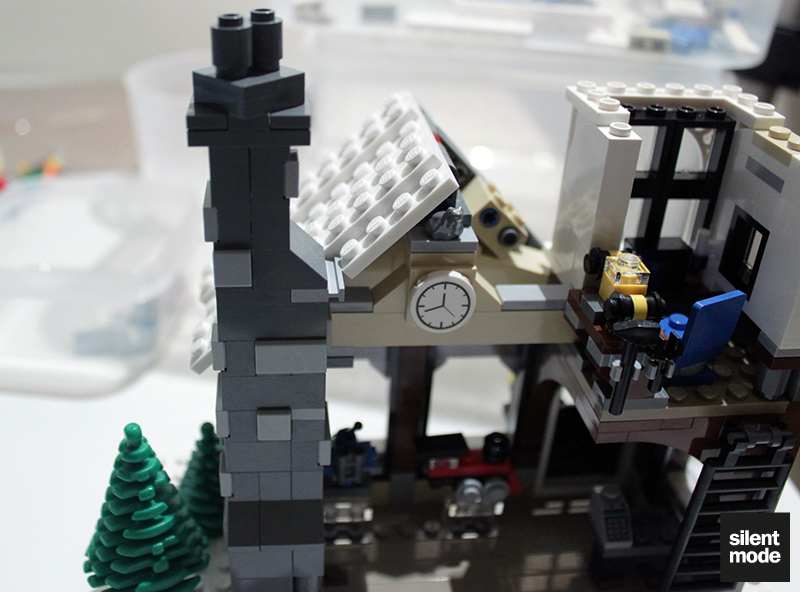 Here’s the first section of roof, along with some detailing – the addition of grey tiles – to the chimney. 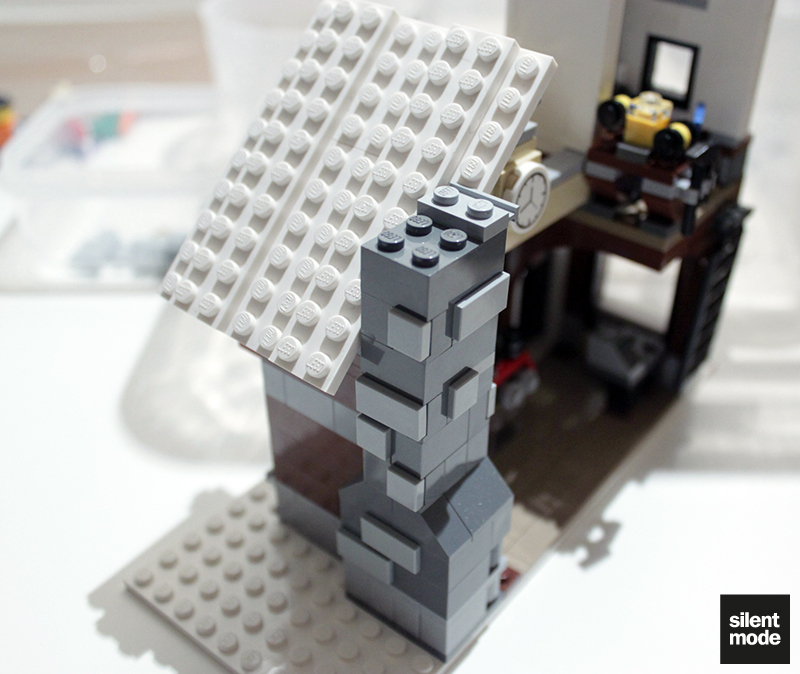 The roof support for the smaller end of the building, which is not as Technic-like as the first, along with the second roof segment. You’ll also notice some simple garland designs adorning the building. All that’s remaining at this stage is the roof pieces to go on top of this section, as well as a few trees to go outside. 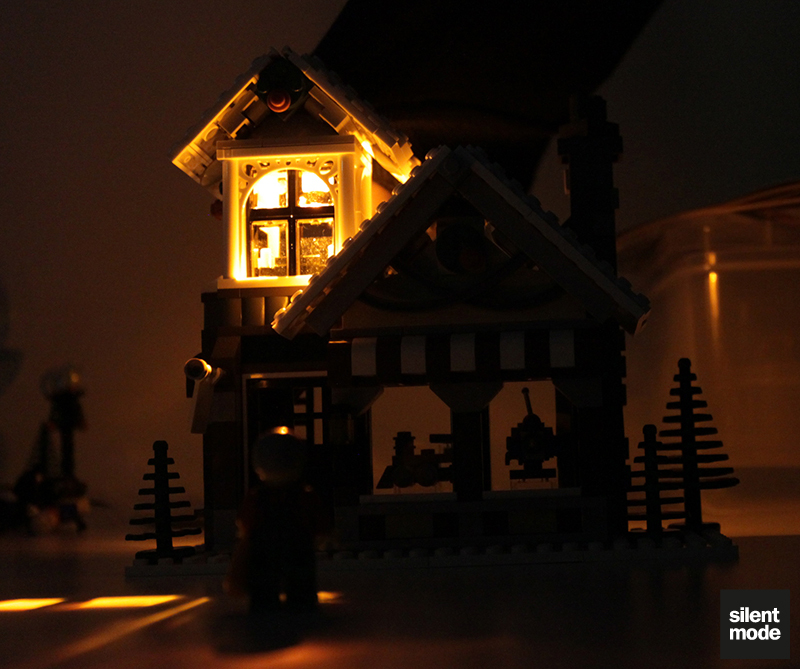 The light brick is positioned above the tiny workshop, to aid the toymaker (the old man) as he works throughout the night. While it provides a very nice effect when switched on, I’d agree that there wasn’t any real need for a light brick in this set. If anything – although I could see it being somewhat difficult – I would have thought the tree would make use of the lighting feature. Now that our Toy Shop is complete, we return to Snowdonia to check out the action. 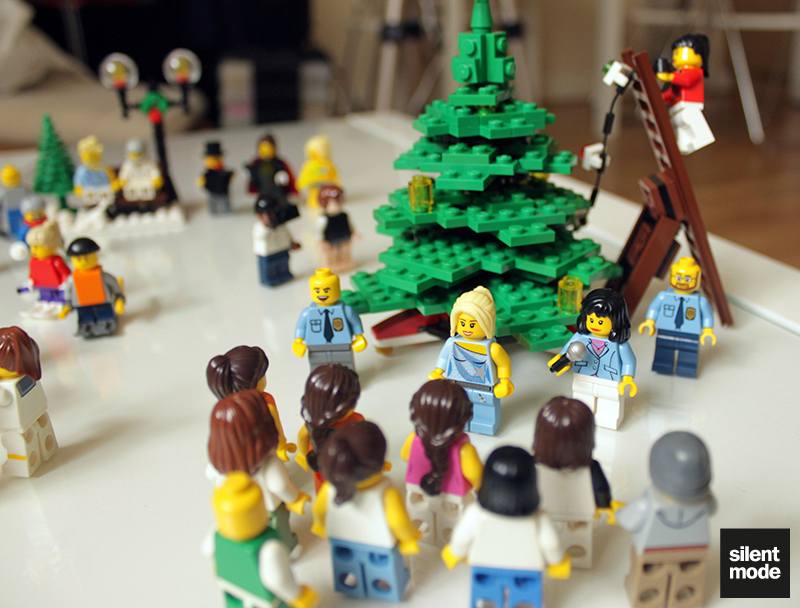 A small crowd of groupies from out of town gather around the village Christmas tree, during a day-long celebration where they switch on the lights. As one of the townsfolk dutifully adds decorations in the background, some C-list celebrity steps in for Saima Gaines, who is MIA. The local orphans, having gotten a pair of skis each, slide around looking for trouble. 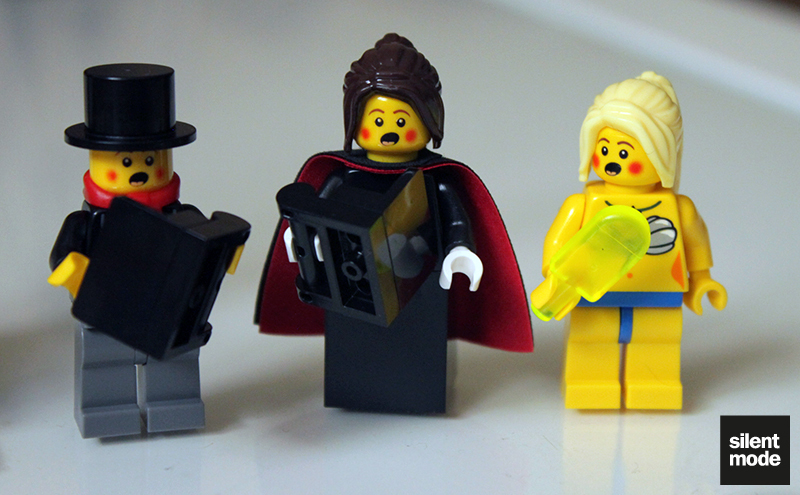 Even clockwork toys scared the living daylights out of these visiting schoolgirls. 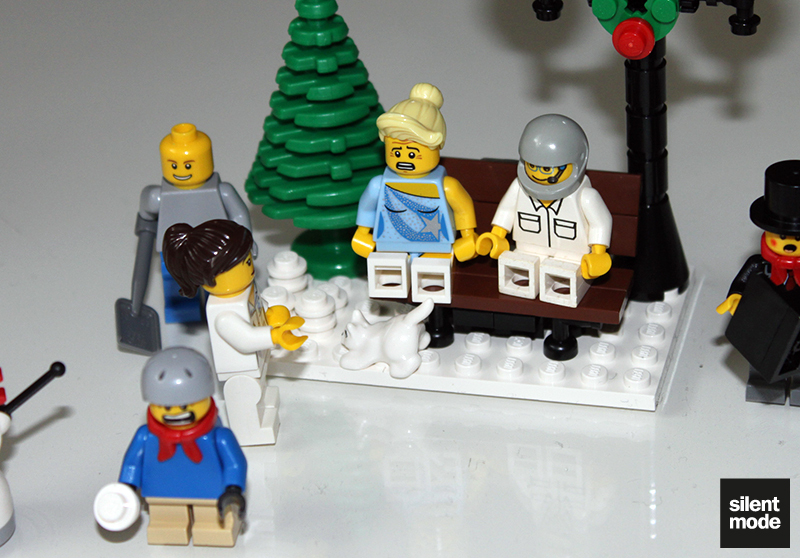 Meanwhile, a couple of patients on a day visit are very well behaved, but impatiently wait for Bryknii’s return. 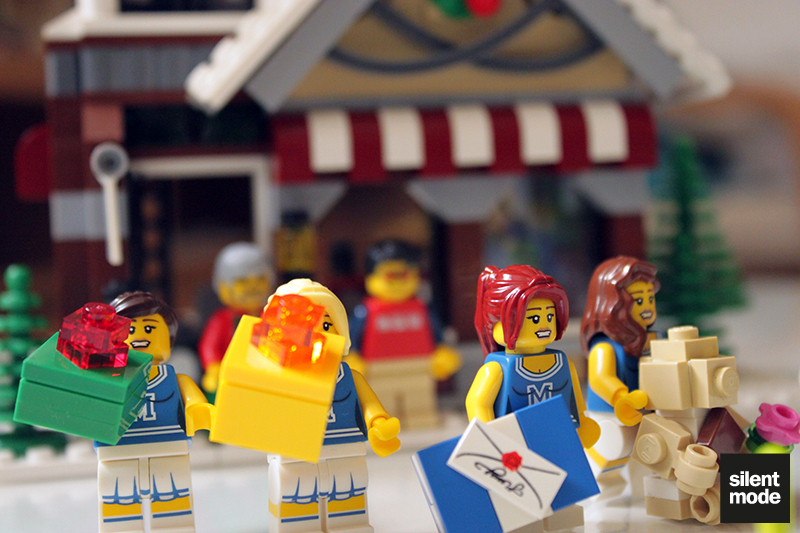 A sorority of cheerleaders spend their respective boyfriends’ money on toys from the Toy Shop, convinced they’re in a real-life Bricks and the City episode. One even managed to get the exclusive “Guu” teddy bear before everybody else. I’ve been looking forward to purchasing and building this set for the best part of a year, and I’ve finally been able to do so. Was it worth the wait, and more importantly the price? 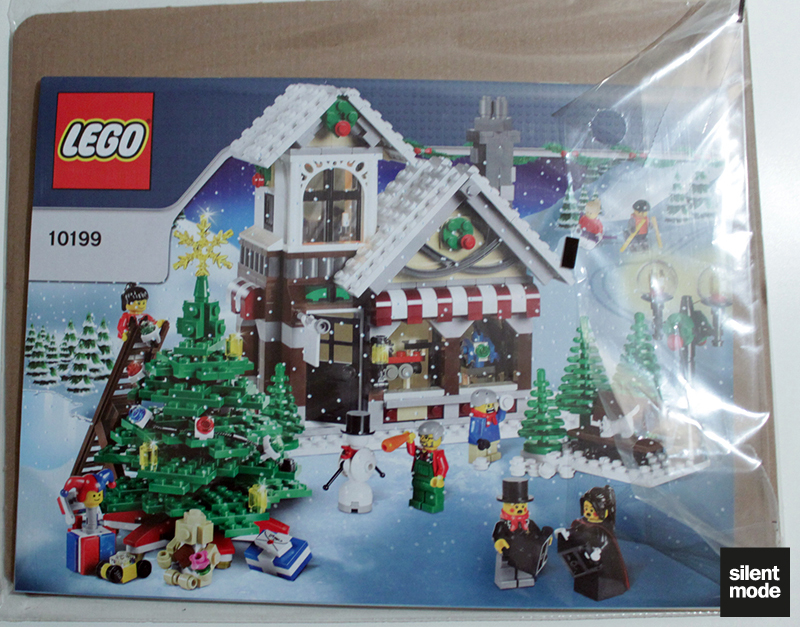 For one, I’d have to be careful when comparing the Winter Toy Shop with the more recent Winter Village Post Office – unlike most people I bought them in reverse order, so my experience is slightly tainted. 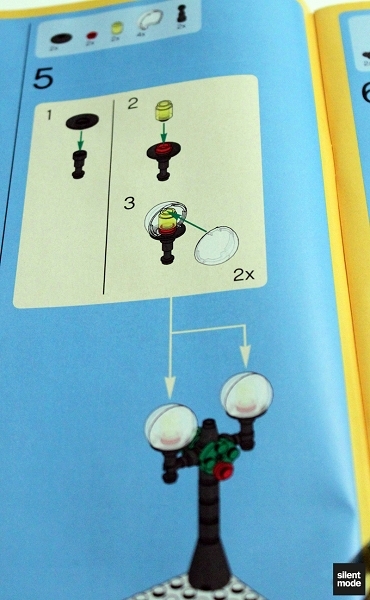 Both sets took around the same amount of time to build, and some of the same issues with the instruction manual (not being able to tell which colour some of the parts, particularly the black, grey and transparent colours) also came up. 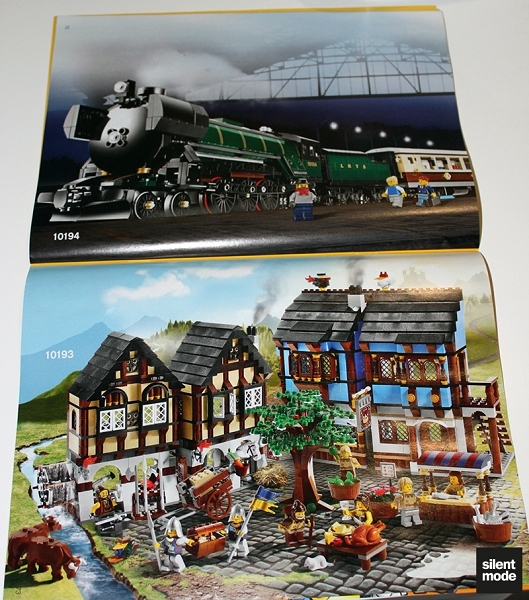 However, building either of these sets first would prepare someone for building the other. 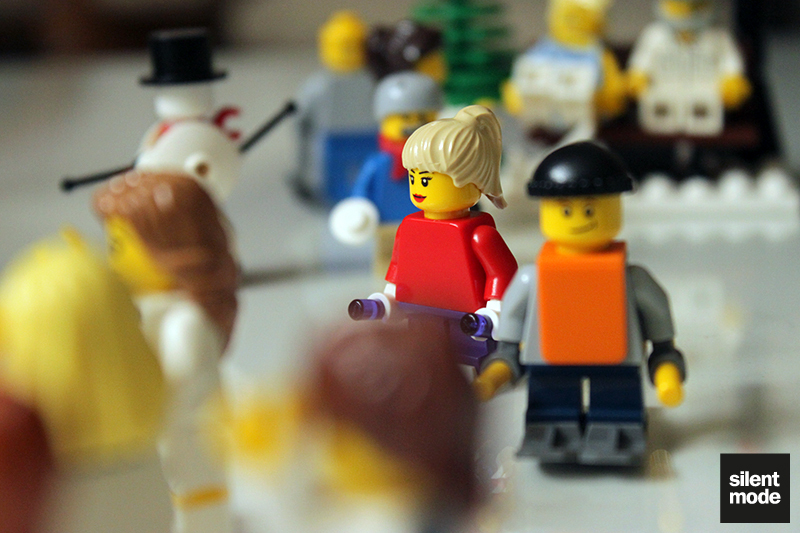 It’s a bit like the educational minifigure sets, reviewed earlier this year: making a decision to buy either of them is initially very hard because of the price, but doing so softens you up for buying the next one. 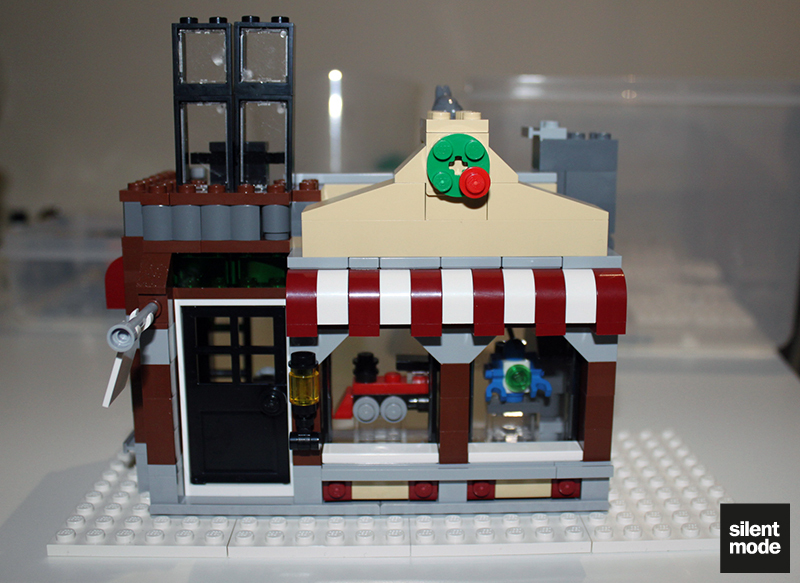 As it stands, I quite like the Toy Shop as a set, and I can see it being part of a layout including the Post Office, despite their contrasting styles (i.e. the presence of Dark Green with the Post Office). 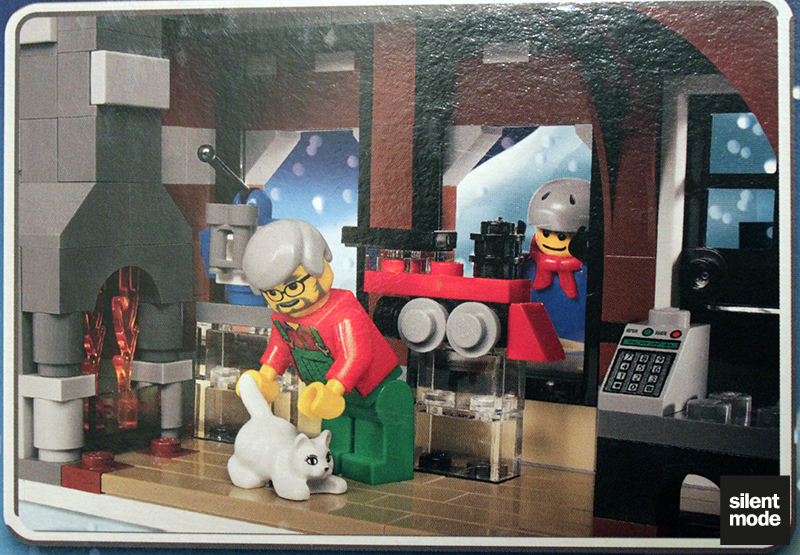 The minifigures would also fit in a display including the Post Office set, although I’m curious why the instruction manual for the Post Office shows that set being combined with the Winter Village Bakery instead. 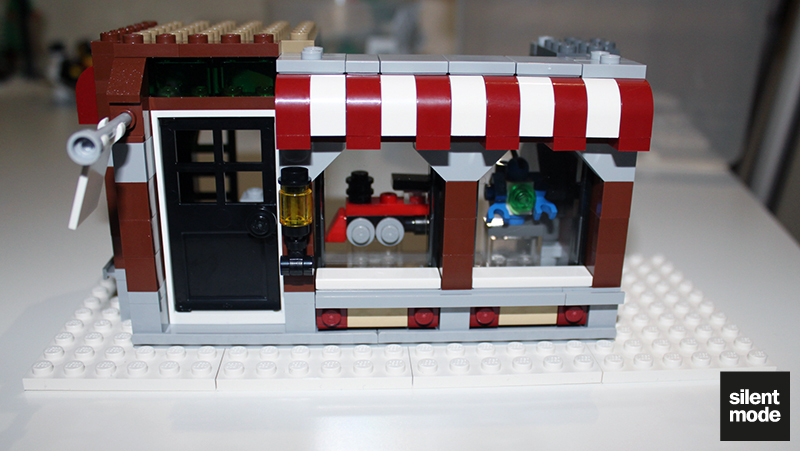 The Toy Shop itself is a neat building from the exterior, and has a very nice interior on the ground floor. 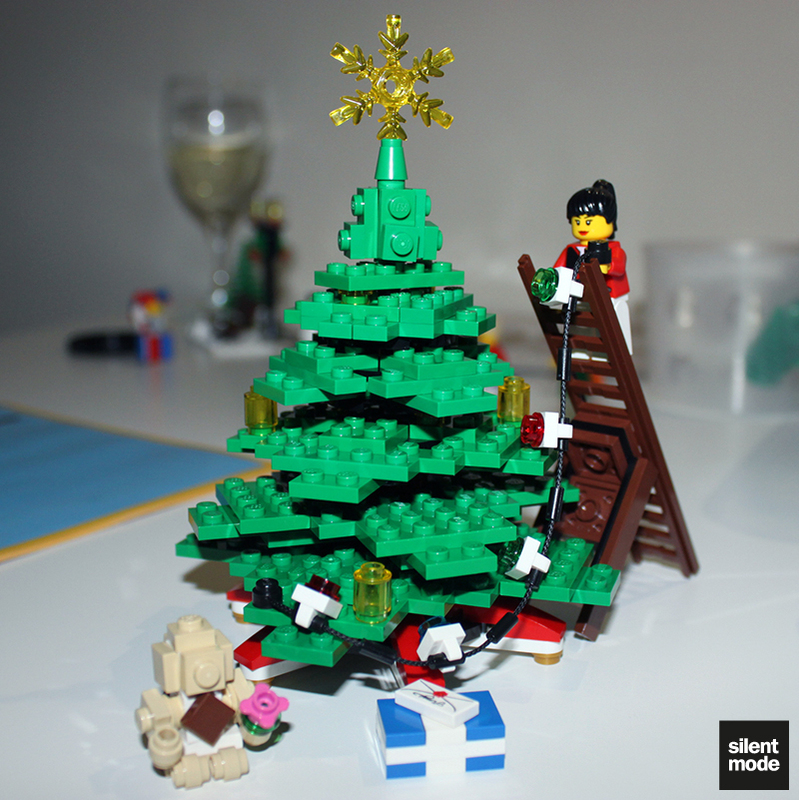 The tree is particularly welcome – whereas we get itty-bitty ones in advent calendars, this tree is a very healthy, minifigure-sized one. 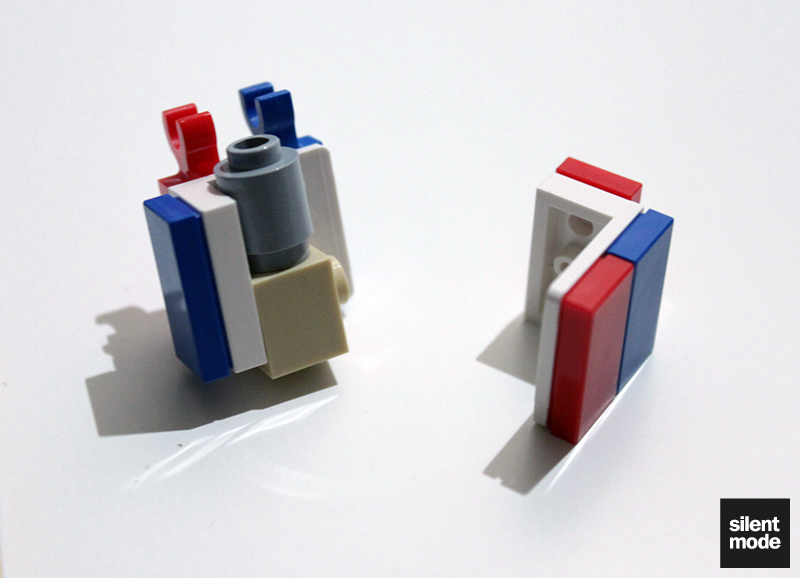 I guess I have a few beefs with the set, the first involving some minor colour choices. I would have gone with either black or brown for the tree base, because right now it looks like it belongs in a Sonic game (as hard as it is to imagine). The garland/wreaths on the lamppost and building would probably look better in Dark Green instead of green (although the round plate isn’t available in that colour). 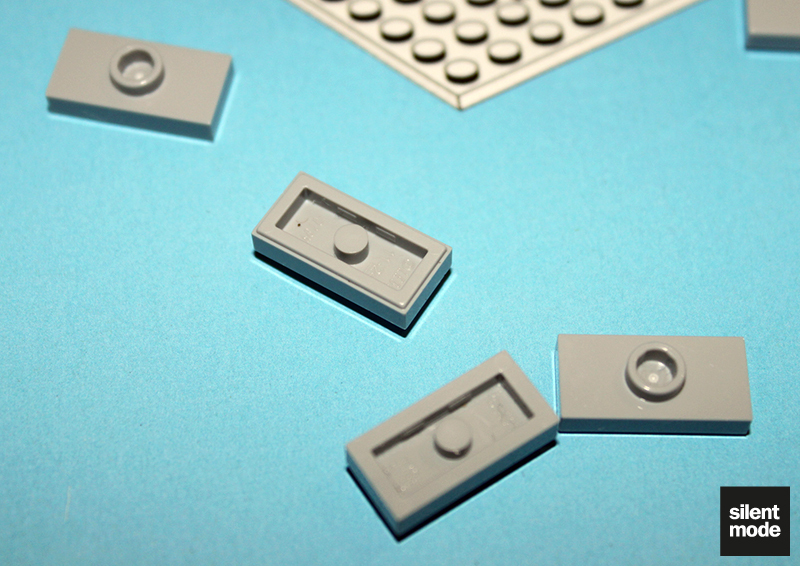 The second would be the use of the light brick, which is the main feature of the set. As it stands it’s more of a nice-to-have than a play feature – but unlike with the Post Office it’s not attached very securely. I’ve had to put it back on the building quite a few times while operating it, which isn’t easy because of the roof. 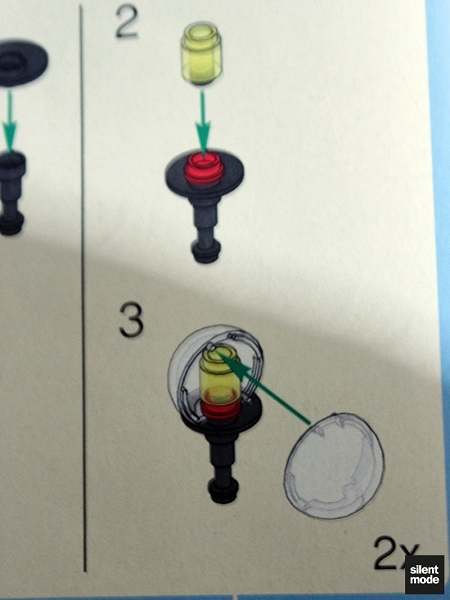 As a small gripe, the order in which the light is constructed means you’ll have to switch it on at least once before it’s put in place, which kinda spoils the suspense. 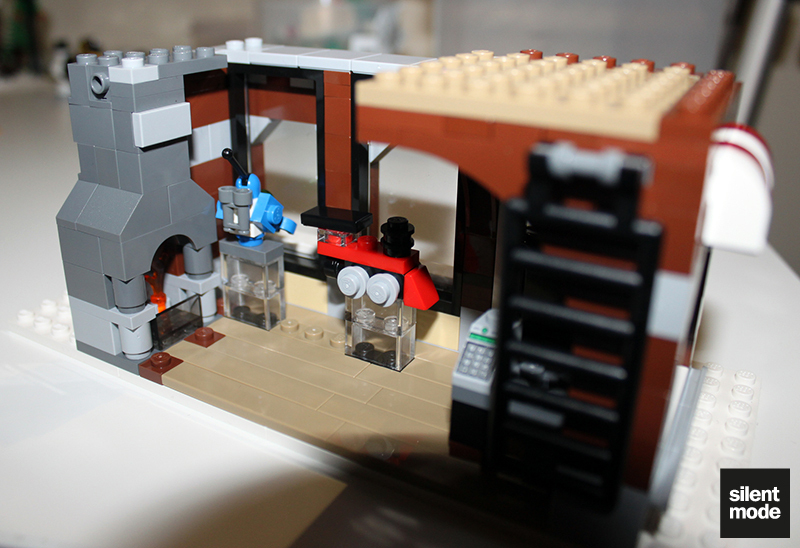 The third is with the size of the workshop – especially since there’s a light in that room you’ll often want to have a minifigure in there, but to put one in will require taking the seat out. Fortunately it’s not too hard to replace. 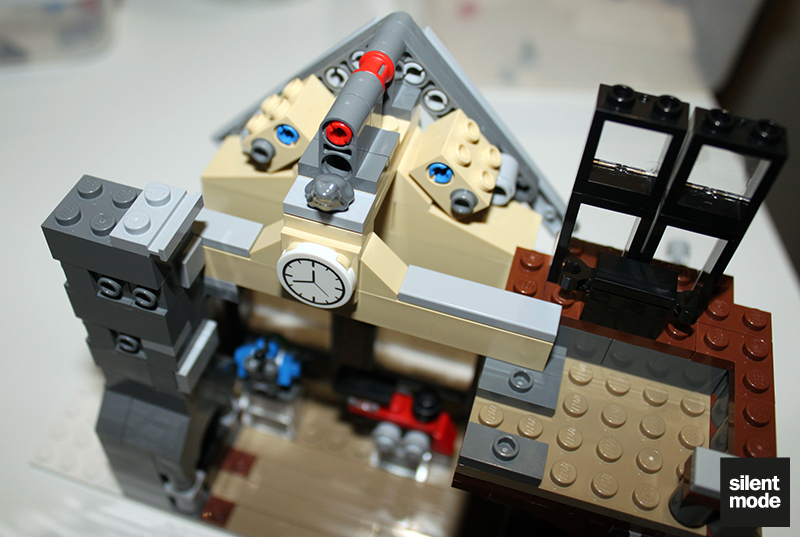 The set makes the most out of the parts available at the time (which I assume they were, as 2009 was within my dark age). The light attachment and the bareness of the tree let things down a little. 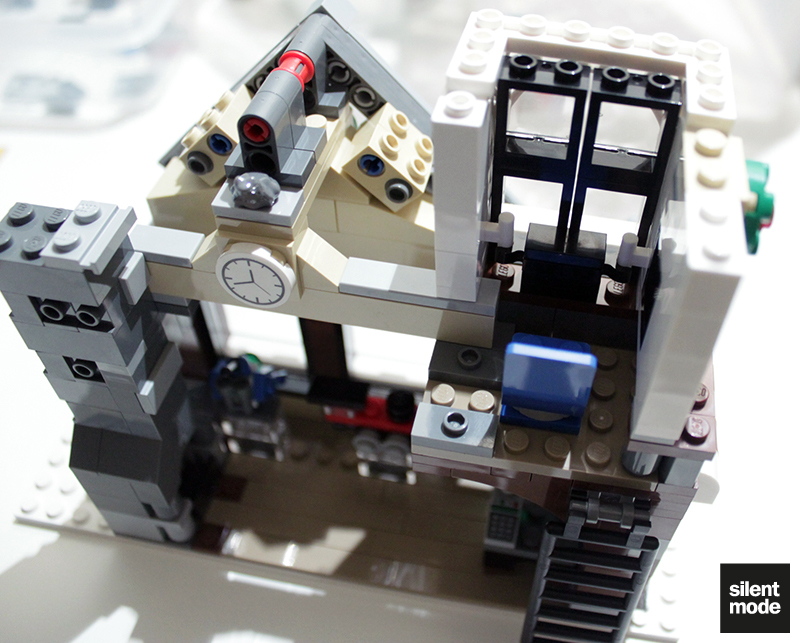 If you've built the Post Office you'll know what to expect with this set, but seeing how everything fits together is rewarding. 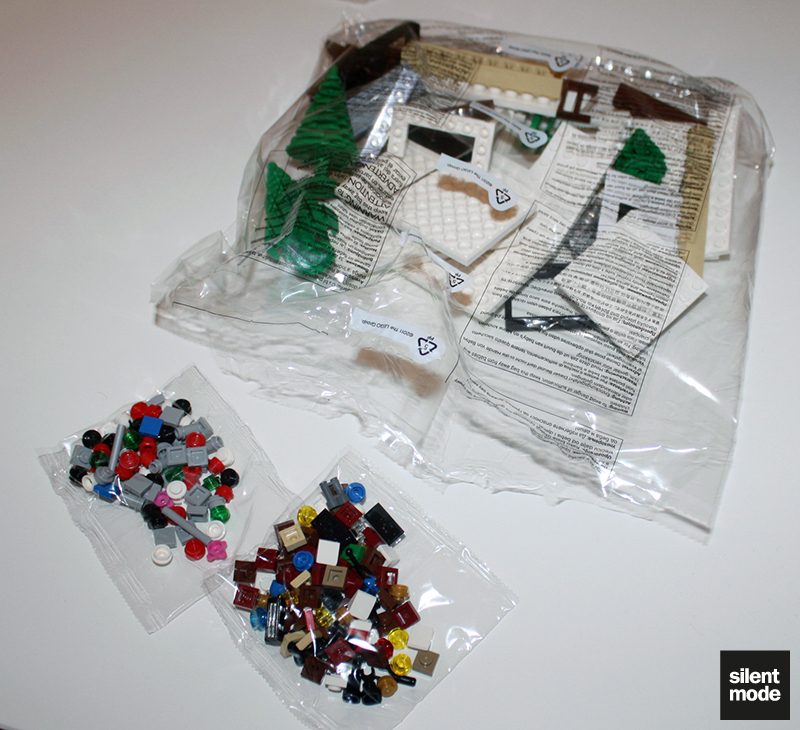 Many useful and reusable parts available in this set, particularly if you like green. We even get four trees! More so than the Post Office, this is primarily a display set - apart from the kids on skis, and of course that workshop light. Of all the problems I have with the set, the ever-changing price has to be the biggest one - especially since it's gone up. Based on these scores I’d give this set a surprising 6.4/10, which means the Winter Post Office is currently my favourite Winter set so far. 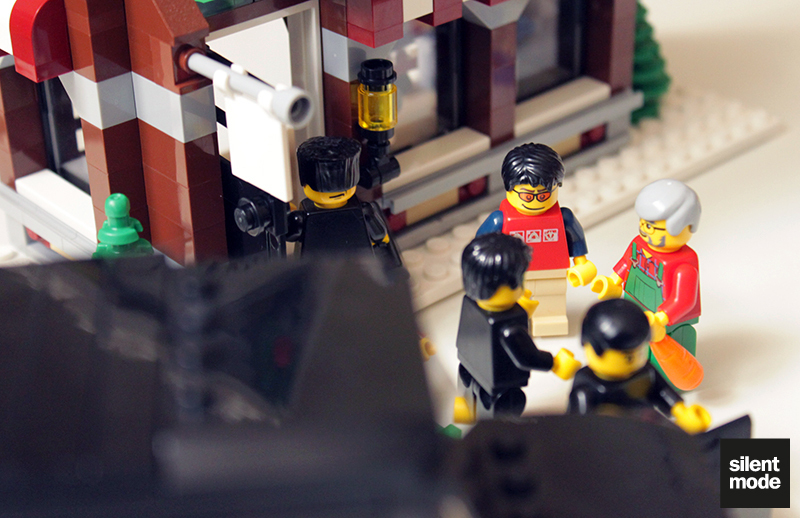 Thank you for reading, and I will probably be back with a review of the Bakery. In the meantime here’s to more Winter sets in the future! What a missed opportunity for a caption contest.